MJW Careers guides its clients in their career paths with outplacement support, career coaching, interview prep, and resume writing services. MJW Careers tasked Sage Island with redesigning its website to improve the overall user experience and encourage visitors to explore their options for professional development. The client needed to advertise each of its separate service areas while promoting the brand as a whole. So, the site had to serve both informational and marketing purposes in allowing visitors to quickly find information related to services of interest, while touting the benefits of those services as provided by MJW Careers. Our development team created a new site map with landing pages for the three areas of service: resume writing, outplacement solutions, and interview prep. Our team also segmented the client’s many testimonials based on the service the reviewer received. Because each landing page had to describe the specific services offered, the landing pages were fairly copy-heavy. To make the content easier to consume, we broke up the paragraphs with images and used CSS header styles to establish a typographic hierarchy. All of this in turn improves search engine optimization as well. MJW Careers had collected hundreds of testimonials over the years, so we highlighted the best of these on their own separate landing page. 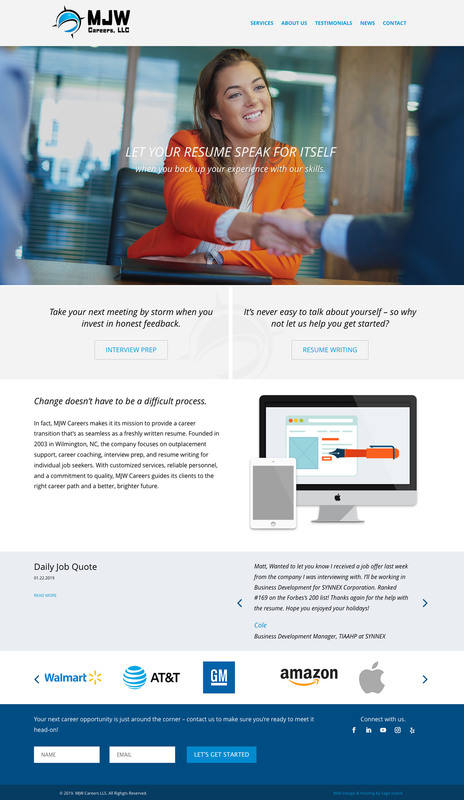 We styled the testimonials with branded colors to give the page more of a visual interest. We further promoted the MJW Careers brand by displaying its impressive client list in a rotating carousel on the homepage.